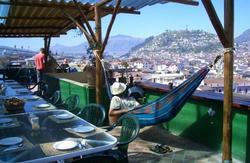 Recently restored house, located in the historic center of Quito, a few minutes from the main tourist attractions. We have 600 m2 of construction, 3 floors with a total of 20 beds in 3 rooms. Each room has a private bathroom and hot water and padlocked lockers. The rooms are bright, spacious, comfortable and clean. There are also very comfortable social areas, kitchen available to guests, WiFi and BBQ terrace! International Airport Mariscal Sucre is 40 km away from Quito Down Town. You could get a shuttle bus per 8 USD (please check http://www.aeroservicios.com.ec/itinerarios/) from the airport to Quito (old airport) and from there a taxi to Minka per 6 USD aproximately. - From Carcelen Bus Terminal, you can take a taxi ($2-3) to La Ofelia Bus Terminal, and from there take the Metro Bus untill Consejo Provincial station. - If you can take the Ecovia Bus, you need to get off the bus at Simon Bolivar station, and from there you can do the 10 minutes walk or take a taxi for $1-2. - From Quitumbe Bus Terminal, you can take the Trolebus up to La Alameda station. From here it's 7 minutes walk, or $1 for a taxi.